Built in the 7th year of the Zengtong reign (1442) of the Ming Dynasty (1368-1644), the platform is 14 meters high with eight large astronomical instruments made in the Qing Dynasty (1644-1911) set up on it. The Ancient Beijing Observatory is located near the heart of downtown Beijing on the south side of famous Chang'an Avenue. Made in the 4th year during the reign of Zhengtong (1439 AD) of the Ming Dynasty and designed for the coordination of celestial bodies. 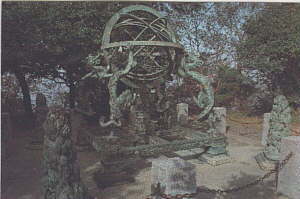 Originally kept in Beijing, it was moved to the Purple Mountain Observatory in Nanjing, Jiangsu Province in 1931. Made in 1673 AD(Qing Dynasty) and designed for measuring the time and azimuth of the rising and setting of celestial bodies, as well as measuring altitudes and azimuths of celestial bodies at any time. Made in 1744 AD (Qing Dynasty) and designed primarily for measuring true solar time as well as right ascension difference and declination of celestial bodies. Made in 1673 AD (Qing Dynasty) and designed primarily for measuring true solar time as well as right ascension difference and declination of celestial bodies. 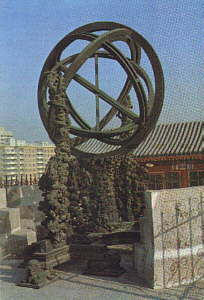 Made in the 4th year of the Zhengtong reign (1439 AD), it is simpler than the Armillary Sphere in both structure and operation. 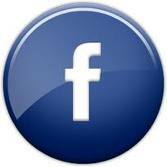 It was moved to the Purple Mountain Observation in Nanjing at 1931. Made in 1673 AD and designed primarily for measuring azimuths of celestial bodies. Made in 1715 AD (Qing Dynasty) and designed primarily for measuring azimuths and altitudes of celestial bodies. Made in 1673 AD (Qing Dynasty) and designed primarily for measuring ecliptic longitude difference and latitudes of celestial bodies as well as the 24 Solar Terms. Made between the 2nd year and the 7th year of the Zhengtong reign (1437-1442) of the Ming Dynasty and designed for determining the length of a tropical year and the 24 Solar Terms. 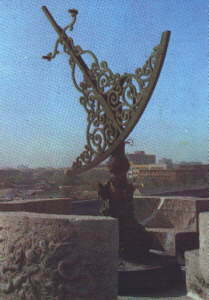 Made in 1673 AD and designed for measuring altitudes or zenith distances of celestial bodies. 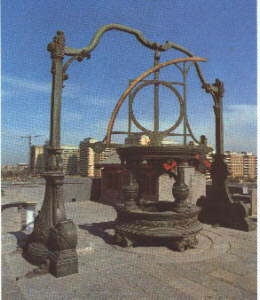 Made in 1637 AD (Qing Dynasty) and designed for measuring the angular distance less than 60 degree between any two stars as well as the angular diameter of the sun and the moon. Tucked behind the southwest exit of the Jianguomen subway station, Beijing's Ancient Observatory is an unexpected break from the surrounding modern towers and hotels. The observatory was once a research center for some of the Ming and Qing dynasties' most important scholars. Built in the year 1442 during the Ming Dynasty, the observatory offers unique insight into ancient scientific techniques. 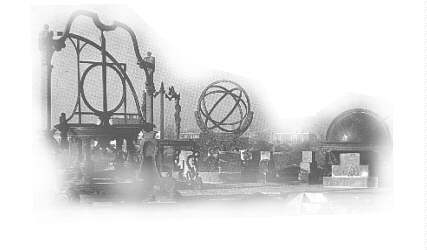 Research at the observatory ceased in 1929 but achieved a world record for 487 years of continuous astronomical observation. But astronomical research in China dates back even further. In 1279, the Chinese astronomers WangXun and Guo Shoujing built a small observatory just north of where the Ancient Observatory stands today. During the Song Dynasty (960-1279), astronomers created a catalogue of 1848 stars and 283 constellations. Some astronomical records date back to the Han Dynasty (206 BCE-220 CE). Astronomy and astrology have historically played a role in emperors' decisions and planning. The ancient Chinese believed there was a relationship between the sky and earth, and that observations in the sky could predict wars and accidents, according to Xiao Jun, Deputy Director of the Beijing Ancient Observatory. As a result, astronomical research was relegated to upper-class scholars and selected foreign missionaries, and the observatory was not open to the public. New emperors often ordered a new calendar to be made. Releasing a more accurate calendar was a sign that the new emperor was truly sanctioned by the heavens. More than 100 calendars were produced starting in the Qing Dynasty. "At first, the calendar was based on the lunar orbit, but this was not suitable for farming, so the solar orbit was added to the calendar," Xiao Jun said. "The lunisolar calendar helped farmers plan their crops." 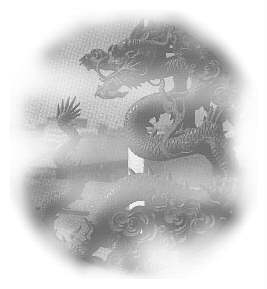 The year was divided into 24 solar terms which predicted the changing of the seasons. In 1281, astronomer Guo Shoujing calculated that one year was 365.2425 days, 300 years before western astronomers made the same discovery and created the Gregorian calendar. The lunisolar calendar system was used until 1911 when the western solar calendar was adopted. In addition to tracking movements in the sky, astronomers also tracked the wind, rain and snow, making their practice a combination of astronomy, astrology, and meteorology. From 1669 to 1674, Emperor Kangxi commissioned Ferdinand Verbiest to design six astronomical instruments, a celestial globe, the equatorial armillary sphere, the ecliptic armillary, the quadrant, the altazimuth and the sextant. In 1715, Killian Stumpf designed the azimuth theodolite, which is a combination of an altazimuth and quadrant and is used to measure the vertical and horizontal angles and altitudes of celestial bodies. 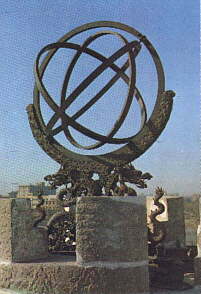 In 1744, Emperor Qianlong ordered the construction of the last astronomical instrument -- the new armillary sphere -- to be added to the ancient observatory. 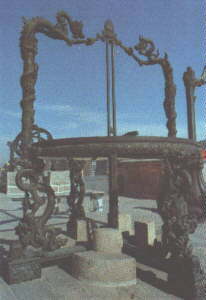 These instruments occupied the roof of the observatory, while the older instruments were moved to the yard below. 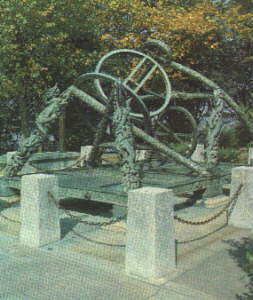 All of the observatory's instruments except the altazimuth theodolite are adorned with bronze dragons at the base, signifying that astronomy was a special discipline for the emperor. A telescope was never added to the collection, although the emperor acquired one and kept it at the palace for personal use. 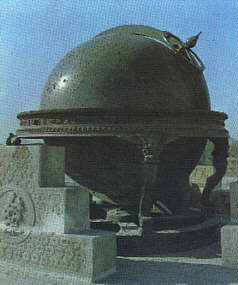 The observatory was raided in 1900 during the Eight-Nation Alliance's siege of Beijing, and the instruments were taken by foreign troops. The French returned five of the instruments the next year, while the Germans took five of them to Europe to display at Potsdam Hall. They were finally returned in 1921. 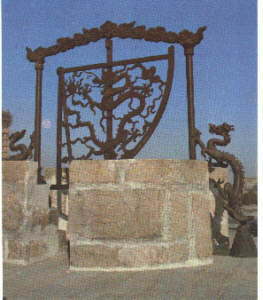 Several of the instruments were sent to Nanjing for safekeeping after the Japanese invaded China. The museum was opened to the public in 1983. Operated in conjunction with the Beijing Planetarium, the Ancient Observatory now receives about 500 visitors per week. 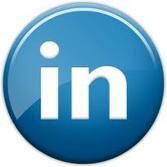 There are detailed English descriptions available. 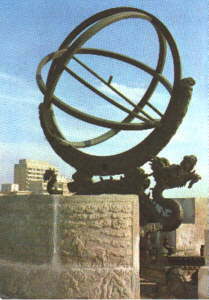 In the courtyards surrounding the Ancient Observatory, there are three exhibitions about the history of astronomy in China, the uses of the various instruments and examples of ancient instruments such as water clocks and sundials. Visitors can also climb to the top of the observatory, which has 99 steps to signify a relationship to the emperor. There they can look at additional instruments displayed on the roof. To learn about China's history with the stars, which mixed astrology and superstition with astronomy and science, visitors can spend an hour or two perusing the exhibits and examining the instruments. Like many of China's more treasured relics, the instruments have been well kept, offering visitors an opportunity to examine ancient science up close. 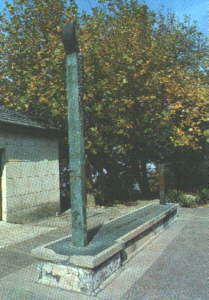 Transportation: Jianguomen subway station on line 1 or line 2, exit C. The museum is directly behind the subway station.